Madeira was the preferred wine of the early United States. Not only did it still taste good after spending months in the stuffy hold of an ocean liner -- it actually tasted better. Look back on menus of fine clubs and wedding parties from the US in the 1700s and 1800s and you'll see Madeira everywhere. Different parts of the country preferred different styles, depending on the climate. What else could you drink in Lousiana, where the ground was too swampy to build a proper cellar and the heat too oppressive for table wine to survive? You'd want a Madeira with a little sweetness to stand up to the cuisine, but throughout the South, you'd want it lean enough to drink with dinner. In New York, you would have a rich Madeira for after-dinner toasts. In Baltimore, the preferred style was called "rainwater" because of the lightness and texture. This name has been around for Madeira forever but is one of the few terms not officially defined by the Madeira Institute. The implication is that the barrels of wine mixed with rainwater, diluting them. Today, that's a disaster. Why would anybody want that? Let me take you back to Baltimore in the summer of 1894. With an entire lineup of .300 hitters, Manager Ned Hanlon's Orioles are leading the New York Giants in the National League pennant race. The Chesapeake Bay holds so many blue crabs and oysters that kids can scoop them up easily with simple nets. The port of Baltimore, sheltered from storms and easily accessed, is thriving, and the town is prosperous. 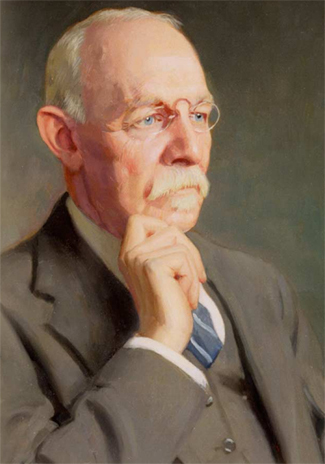 At Johns Hopkins University, cocaine addict William Stewart Halsted is creating modern surgical procedures partly because of his habit, which gives him an obsession with cleanliness and enough of a worry about tremors to slow down procedures that used to be done as fast as the doctor could cut. The revolution in medicine draws wealthy patients from all over the country and even from Europe, leading to a boom in luxury hotel construction because these people traveled with a retinue. Baltimore's a happening place, with a blend of sophistication and down-to-earth people that it still enjoys today. But it's hot and humid all summer. National Bohemian beer is already a favorite in the city because it's a light pilsener. The local bars -- one owned by George Herman Ruth Sr., whose wife has just realized that she's pregnant -- serve steamed crabs for free as bar snacks. Why not? The barkeep can throw a chicken neck into the harbor and quickly net a dozen. 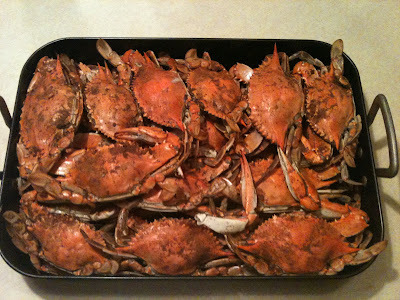 To encourage more drinking, the bars season the blue crabs with a spicy, peppery mix. This was blue-collar Baltimore dining at its finest in 1894, and still is today. So what do you want to drink with that? Well, sure, pilsener. But what if you want to drink wine? What if you're a patrician family, it's July, it's 93 degrees out with 90 percent humidity, and you're entertaining? Today, you might serve a nice glass of very cold Sauvignon Blanc or Pinot Grigio. But back then, stainless steel fermentation hadn't be invented, nor had anaerobic fermentation. White wines were cloudy, oxidized, and without fruit flavors. If you were served one of these wines today, you'd make a face and send it back. What you'd drink, chilled with blocks of ice purchased from the ice man, would be a lean, light, refreshing Madeira. You wouldn't want a rich Malmsey or a sweet Bual. You'd want a fortified wine to do the job in 1893 that Pinot Grigio does today: refresh you, go with your food, and not make too many demands on your palate. This is why rainwater Madeira mostly disappeared from the market: Pinot Grigio took its place. There's a bit of a Madeira revival going on. No wonder, as it's one of the greatest wines in the world. It lasts longer than any other wine, before or after you open the bottle. I love tawny Port, probably the second-most indestructible wine in the world, but you usually need to finish a bottle within a few months of opening. An open bottle of Madeira might last two, three, four years -- if you can resist it that long. More than just indestructible, Madeira is delicious, complex and refreshing. Drier styles, like Sercial, are great aperitifs. I love moderately sweet Verdelhos as a digestif. Despite the revival, where "rainwater" Madeira existed until recently was as an all-day tipple for British retirees. You can see where its unique qualities would make it appropriate, and nobody was taking it seriously enough to ask more of it. Rare Wine Co., run by history professor turned entrepreneur Mannie Berk, has had as much to do with the Madeira revival as anyone. Berk worked with Barbeito winemaker Ricardo Freitas to create the Historic Series, which began as an affordable, nonvintage introduction to Madeira's four main single-variety grapes. They're named after the cities where those styles were most popular: Charleston, Savannah, Boston, New York. Madeira is all about amazing one-offs. The growers are all independent and there are still decades-old barrels of vintage wines hidden in basements on the island. Berk and Freitas got into the spirit of that with occasional one-off Historic Series specials, based on the style of Madeira popular in New Orleans or Stratford. Or, in last year's release, Baltimore. I'm from Baltimore and I was so excited when I learned of the Rare Wine Co. 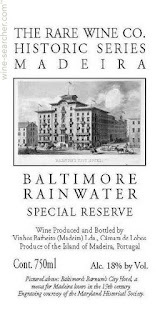 Historic Series Baltimore Rainwater Madeira. I asked Berk to send me a sample bottle. He said it was already sold out, just weeks after its introduction (by contrast, 50-year-old vintage Madeiras will sit on his inventory list for a year or more). But he sent me two 50 ml sample bottles. The wine arrived. I poured a 50 ml sample. I drank it. Went down easy. Hmm, better take some tasting notes. I poured the second one. And took a sip. And another. And got distracted, and that sample was gone too. Man, I drank that stuff like rainwater. What's it like? Well, it's the kind of Madeira one could drain without a second thought. It's mildly nutty and only moderately sweet. You could have it as an aperitif on a hot day; I think it's a little insubstantial to be a digestif, which is where you find most Madeiras on wine lists. Ideally, it's a "session" Madeira, for retirees who hit the lotto to just drink all day long. Honestly, I had a hard time imagining exactly how I would use a bottle, especially at modern prices. But that 100 ml lasted about five minutes, so maybe my imagination is limited. 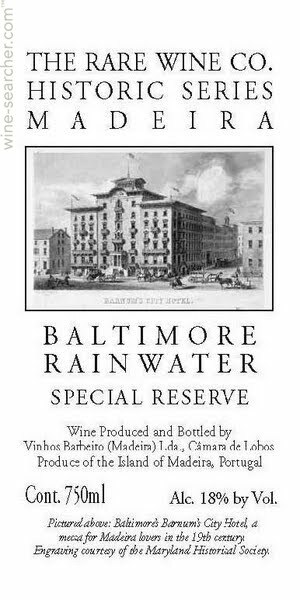 The best price I found for Baltimore Rainwater Madeira on wine-searcher.com was $70 at The Wine House in Los Angeles. Order it here.